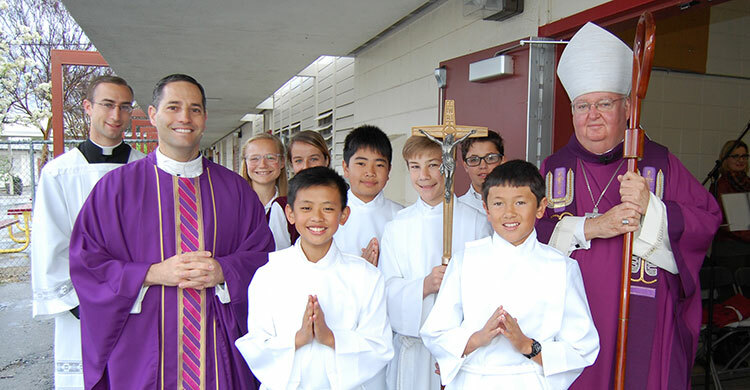 Bishop Patrick McGrath of the Diocese of San Jose visited Canyon Heights Academy the morning of March 22. He was warmly welcomed to campus by Dr. Margaret Richardson, Head of School and Fr. Anthony Sortino, Chaplain. He then celebrated Mass with the students, faculty and staff, and many parents. Following Mass, he joined the parents for a reception and then visited classrooms throughout the campus. Beginning with the youngest students, he visited the Mommy & Me program, Preschool, Kindergarten, Lower School and Middle School. The students asked many questions and no question was off the table. When asked if about becoming Pope, the bishop’s answer was both candid and humorous. One Middle School boy requested the bishop to pray for his autistic brother, and Bishop McGrath assured him of his prayers.